Dog Poop Is Natural, Right? You are here: Home / The Eco Dog / Dog Poop Is Natural, Right? Well, POOPING is natural. The effects dog poop can have on people and the environment is not. 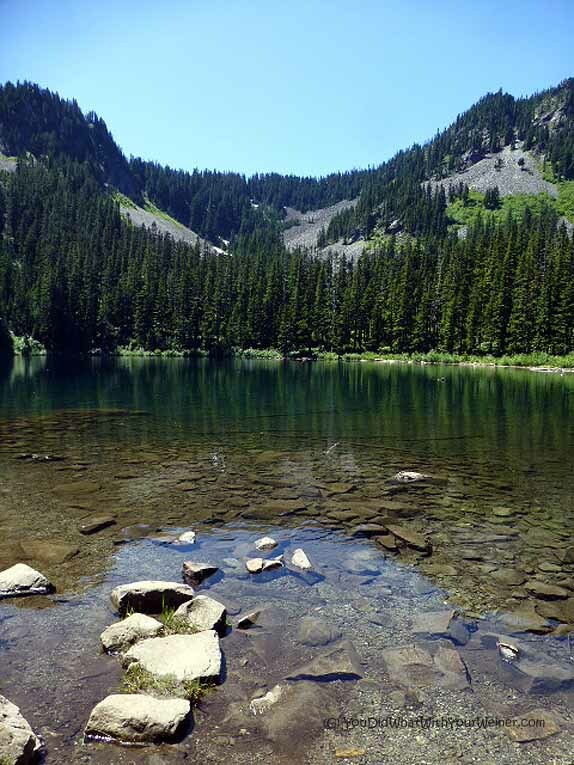 Yesterday I ranted a little about pet owners leaving dog poop on hiking trails. Well, specifically, the rant was about people scooping the poop but then leaving the little plastic baggies on the side of the trail. I do sometimes see naked poop piles on the side of the trail too though (or the sidewalk around home) and it makes me so mad! In my former career (I am taking a break to go back to school) as a Surface Water Quality Specialist, I did a lot of research on people’s attitudes about pet waste. Did you now that a 1999 study by the Center for Watershed Protection found that 41 percent of bay-area dog-owners rarely or never pick up after their pets? Yes, we would hope that number would have improved since then. However, the percent of dog-owning households has in creased since 1999 so I bet that figure is still about the same. I found that a big factor in people’s resistance to picking up dog poop the perception that poop is natural – that it doesn’t hurt anything by leaving in on the ground and “letting it go back to nature”. In actuality, there are a lot of issues with leaving pet waste on the ground. First, pet waste contains a lot of bacteria. Besides the fact that someone could get it on their shoe, on their hand when trying to get it off their shoe and somehow on or in their person (yuck, but kids eat dirt that can be contaminated with it) and get sick, it’s bad for the environment. A pile of poo never actually “disappears”. Sure, it appears to go away but it really just breaks up into thousands of tiny poop piles that aren’t detectable by the human eye. Some of those microscopic poop piles get picked up on shoes, some nestle into the dirt where the bacteria can multiply and some take a float trip when it rains right into the nearest waterway. Pet waste is one of the most common contributors to making water unsafe to drink or swim in. Another huge factor in people not picking up pet waste is not having a bag. Maybe they don’t ever carry them, or maybe they just forgot one at home, but it means that they couldn’t scoop the poop if they wanted to. I recently found out about this great company called PoopBuddy. I was contacted by them because they are new subscription box service and they saw my post comparing all of the dog subscription goody boxes. This box is totally different from those boxes though – it directly helps to protect the environment. The founders of PoopBuddy are not scientists but did a ton of research on the correlation between pet waste and poor water quality. I talked with one of the founders for an hour on the phone the other day and she pretty much told me everything I had learned in my 10-year career about the issue – the health risks of abandoned poop and how it can ruin our water supply. It was clear she was very passionate about it. 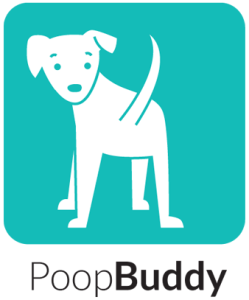 PoopBuddy has created a subscription service to help more pet waste be picked up. First, if you automatically receive poop bags in the mail monthly, you won’t find yourself empty handed when doody calls (punn intended). Better than having an endless supply is that these bags are fun to use. 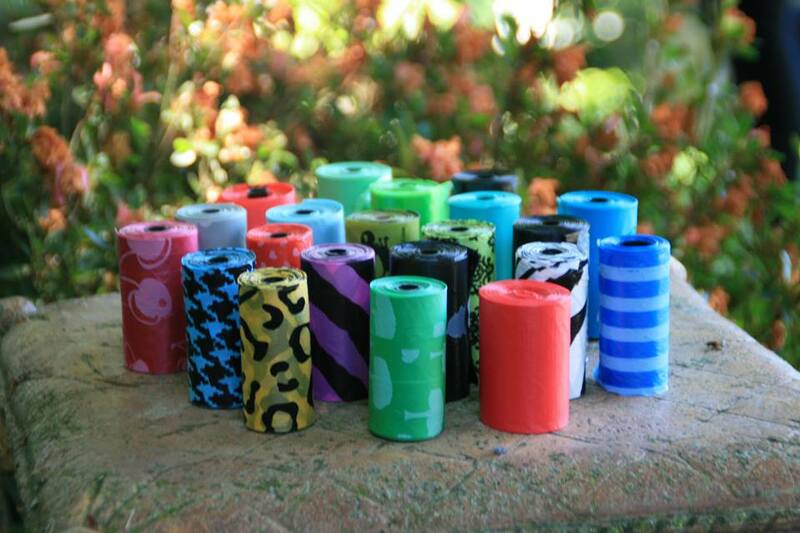 PoopBuddy has scoured the market for eco-chic poop bags with the most fun and stylish prints. If your poop bags are making a fashion statement, you will proudly carry them and send the message to others that scooping the poop is the right thing to do. If the prints are fun, they will also make you WANT to use them and less likely to forget them at home. I am going to be getting a little present (no, not a pile of doo doo) from PoopBuddy and I plan to write a full-review later to give you the total scoop (hey, this post is full of punn opportunities. Ha, ha). Until then, you can check out their website yourself or get updates from PoopBuddy on Facebook. Thanks for the post! You do a great job busting common ‘poop’ myths. Interesting idea for the PoopBuddy for the lazy folk I suppose, but at $12/month for poop bags you can buy at the dollar store (eco friendly ones), I’d rather bike to the store and buy 60 bags for a $1 and save on the carbon footprint that way! You are clearly very motivated to pick up poop like me. There are many other people very less motivated out there and I think PoopBuddy is trying to reach those people. They want to appeal to these people’s the eco-chic and stylish nature to motivate them to pick it up (instead of beating them over the head with the message that is clearly not sinking in). I’m still trying to get my head around people who want fashionable poo bags. But whatever works, huh? I’ll admit it, we’re a different breed 🙂 haha But, I like to customize and add color to everything in my life. Plus, we figure it’s a fun way to encourage people to pick it up. It is very frustrating when dog owners won’t pick up . . . . sigh! Those bags are great looking! Thanks! 🙂 And yes, there’s nothing worse than having to deal with another pet parent’s poo leftovers. Yes the pooper scooper story is always looming greatly for the dog world and the non-dog world(such a strange breed they are, doncha think). My side leg pocket whether shorts or long pants always has a good supply of plastic bags. We walk a lot at a city park which is 90% dog friendly ~~ YAY ~~ and they provide plastic bags for us that need to bend over and scoop up the poop. Have been known to do other peep’s dog poop too. SO gross when people leave it behind. Thanks for talking the talk ~~ let’s hope those peeps that ignore their dog pooping finally get the point. Most of our City Parks provide poop bags also. Unfortunately, sever municipalities had the money to install dispensers but ran out of funds to keep supplying bags so there are not always some in there. There aren’t, of course, any bags provided on wilderness trails. Yes, Florida is one of the leading states on the issue. The Everglades are a veritable toilet bowl for you guys – EVERYTHING washes down there – and a very fragile Ecosystem. At least that is what someone on the opposite corner of the country heard. The educational exhibits are great! Great and timely post! I’ve had one roll of poop bags for over 2 years because the Newfs don’t poop on walks. However, tonight I was out for a walk with Leroy and he pooped. He never poops on walks so of course I didn’t have anything with me when me and I told him to stop pooping! He didn’t listen and kept on poopin and there was a lady walking a few feet behind us and I was thinking, :”oh great she’s gonna see me not pick it up and yell at me,” Well she crossed the street-hahha:) but I walked home got some bags and went back and picked it up. I know that I get grossed out when I see dog poop laying around on the sidewalk and I can only imagine what people would think if they saw Leroy’s giant pile when they were out for a nice walk! I’ve heard of PoopBuddy recently and they sound like a pretty cool company with a nice idea. A problem I remember seeing a lot was giardia. It’s been rampant in apartment complexes because people aren’t picking up after their dogs. Then other dogs come and drink in water puddles and the cycle continues. I don’t doubt that. Dog poo has a lot of bacteria. People often think dogs are immune to getting sick from bacteria but in high enough concentrations they can. We saw those bags on another blog a while back. My mom has bags everywhere…in her purse, in every pants pocket, in the car, most likely tucked into her own undies…they are everywhere “just in case”. But I am sure the day will come again when she needs one and does not have one…she does her best, though. Those poopbuddy bags look like a great idea! I think my trainer carries those. I’m going to check them out. I received a package this weekend and I’m excited to take them for a spin. Although I think the idea of having fashion poo bags is silly, I still love them and I can’t wait to sport them when walking the dogs. 🙂 They are too cool! It amazes and disgusts me how fellow dog owners just don’t care! It takes seconds to pick it up – it’s not hard and there’s no excuse! Thank you for helping to spread the word and educate people about the environmental impact of dog poop! So many people think it’s “natural” but it’s important to help people understand that dog poop is not a natural part of the environment. It drives my mom totally nuts to see poop when we’re out hiking. She thinks, what kind of person cares enough about their dog to take them hiking, but then isn’t responsible enough to pick up after them. Maybe they’re lazy (but would they be out hiking if that was the case?) but maybe they just think it will biodegrade without hurting anything. So it’s important to educate people that not picking up poop is indeed very harmful. Thanks! Lazy is a case-by-case thing. I recycle like nobodies business but forget to turn lights off behind me sometimes. I think there ARE people with enough motivation to hike but not enough to pick up poop. Apparently they don’t associate picking up poop with preserving the beautiful environment they are walking in. You won our treat contest! Drop me a line with your treat preference, steer sticks or crown knuckles, and a mailing address. Congratulations! Great post and I think those poop bags are kind of cool! Anything to get the humans to pick up after their dogs! We’re fighting this battle where I live. People think that pooping in the woods is okay. Thank you! We were at a lovely trail at the ocean this morning. But instead of smelling the chaparral and sea breezes, our noses were assaulted with DOG POOP! It’s nasty and rude, and it really needs to stop. Oh, no….that is a bummer. Even if people don’t realize it is bad for the environment, I wish that they would get that it makes the visit unpleasant for other visitors. Absolutely one of the most fascinating blogs I have read. I got some information about dog poop. Keep it up. I didn’t know that unpicked up dog poop could end up affecting the water supply. I’ll have to hire someone to take care of that since my husband wants to adopt a dog. That way, we can ensure that our dog’s poop doesn’t end up causing any other problems.